The term "Growth Mindset" seems to be all around us these days. I was first introduced to this term and concept two years ago while I was taking my Math Specialist courses. We watched a number of videos from the fabulous Carol Dweck and talked a lot about the importance of building a growth mindset in our young mathematicians. 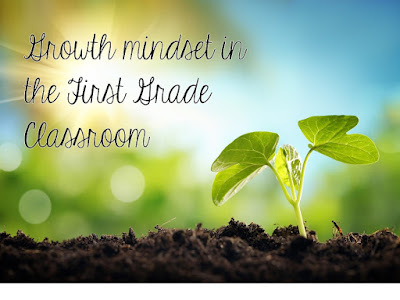 This year I am trying to be very explicit in my teaching about growth mindsets with my students. We talk about the power of yet - that there are things we can not do....yet, but we need to keep trying and practising and we will get there. We brainstorm things we can not do....yet. We watch this video about once a week, to remind ourselves of the "Power of Yet" and to celebrate some of the things we can move from our "not yet" category to our "now" category. Next we moved on to some picture books. 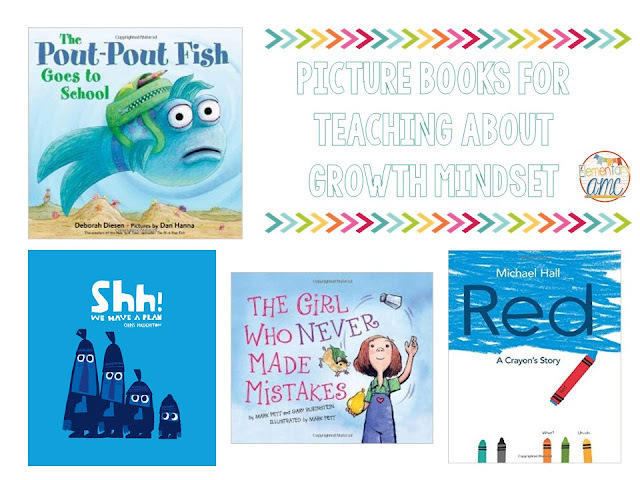 The two books we have focused on the most are "The Pout-Pout Fish Goes to School" and "The Girl Who Never Made Mistakes". But once you start focusing on growth mindset you start to see how many books have the message of not giving up. When we were reading Turkey Trouble for Thanksgiving we even noted how Turkey had a growth mindset - he kept trying different costumes - lots of them where not quite yet costumes but he did not give up. I photocopied the template on to cardstock (blues, purples and greens) and let the students pick the same colour for the body and fin or two different colours. I think they turned out great both ways. With the book "The Girl Who Never Made Mistakes" we talk about the importance of taking risks and facing challenges....this is how we grow. We talk a lot about challenging ourselves and with many of our activities I point out ways they could challenge themselves to do more or better. We also talk about how mistakes make our brain grow. First we learn from trying. Second we learn that our first try did not work - our brain has to work to realize when something isn't working. Third our brain grows again when we try and fix our mistake or try again. The only way our brain doesn't grow is when we don't try or don't learn from our mistakes. If you want a copy of these signs click here. We also completed this fabulous freebie from Growing Firsties (make sure to check it out - it is part of a fab post). It is a great little book that helped my students focus on what they had to work hard on and for me to share my own struggles. Also it allowed us to write out phrases we could repeat to ourselves over and over to keep ourselves trying!! 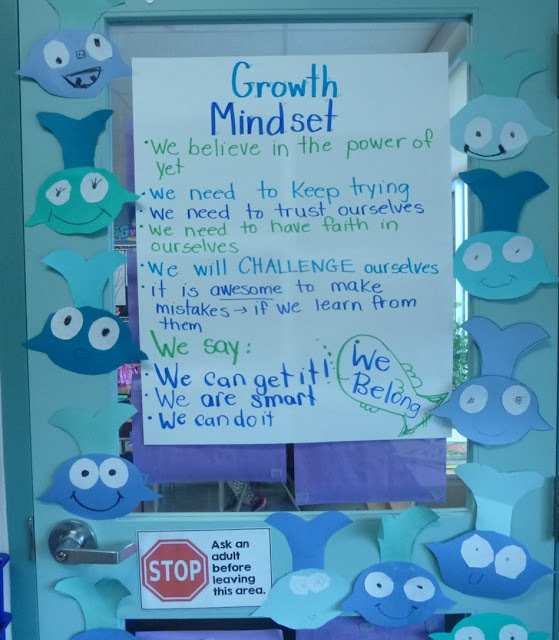 Here is another fun freebie of 2 posters to get you going (or just decorating more) with growth mindset in your classroom. 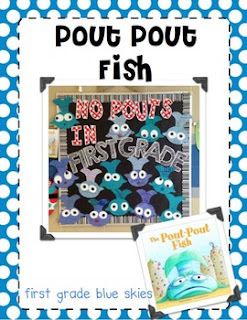 I'm glad your students enjoyed The Pout-Pout Fish Goes to School! I have some small bookmarks that go with the book -- if you'd like a batch for your students, let me know and I'd be glad to send them. Happy Reading and Best Fishes to you and all your students!